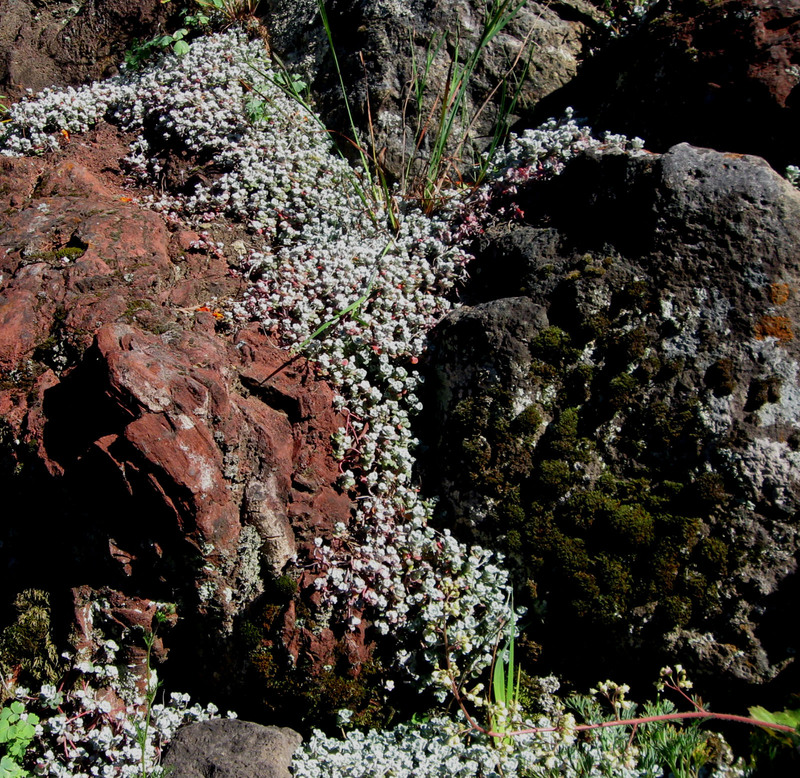 Our Sedum spathulifolium (stonecrop) has started blooming. I like the flower buds better than the flowers, which are a bit too mustardy for my taste. In our garden we have it in containers. I keep accidentally knocking off little pieces of it, which I then put in potting soil to root and make new plants. I now have six little sedums in thimble pots and stubbies, a couple of which are preparing to bloom. We planted spathulifolium in a couple of gardens last year, but we tend to reserve for extreme sites where it takes a while to establish and spread, so the plants aren’t really photo worthy yet. 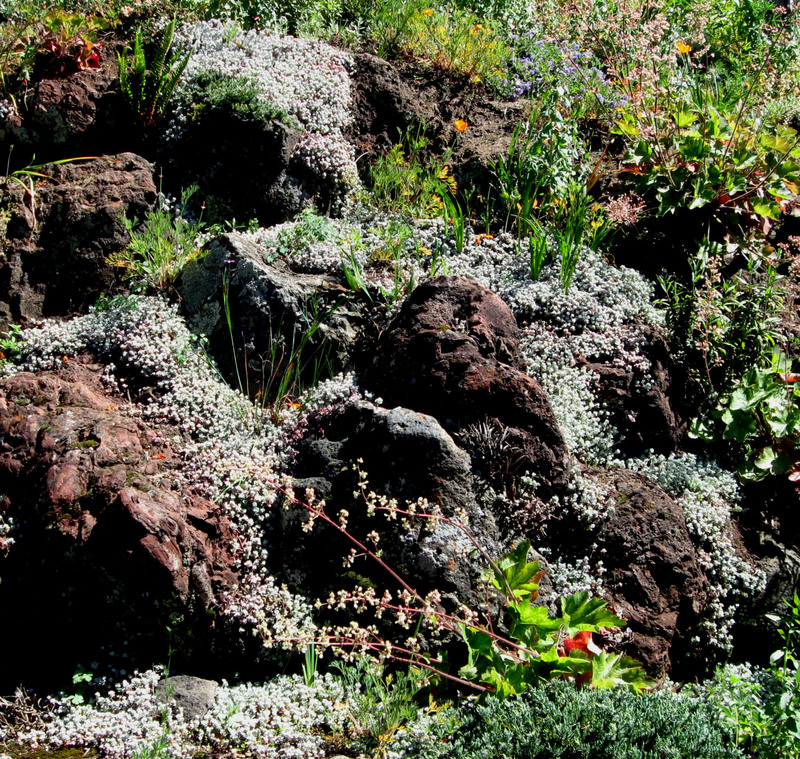 The Fleming garden has the best planting of it that I’ve seen, cascading down the slope between the rocks. 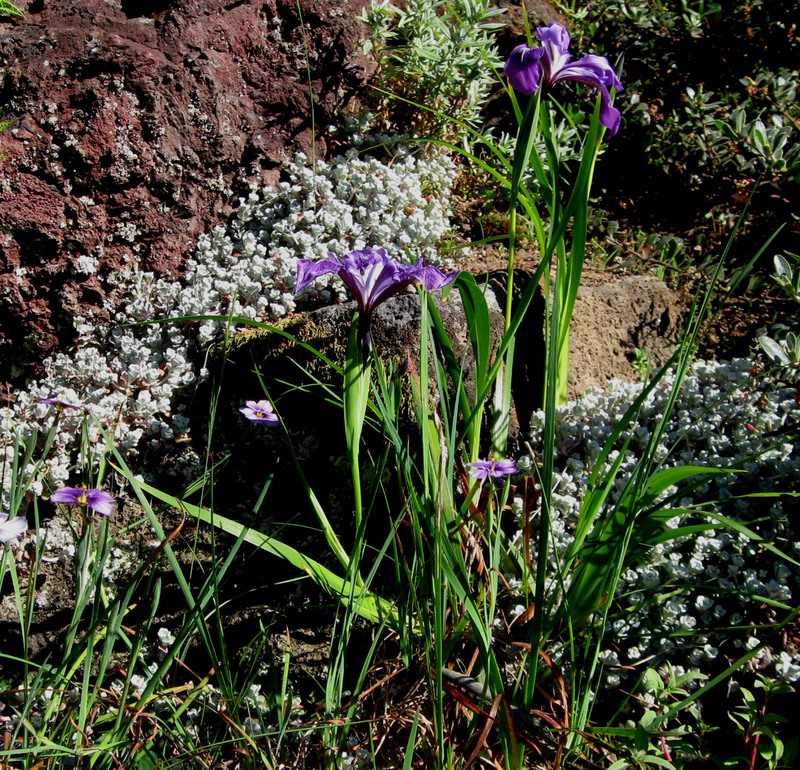 It can be hard to get plants to survive, let alone thrive, on a slope that steep, but the spathulifolium clearly likes the extreme exposure; easy to see why it’s one of the main California natives that appears on green roof plant lists, like the one for the Academy of Sciences Building. I have several more photos from the Fleming garden below. I wish I’d been there when the light had been more amenable to photos, but I don’t see a way to fix that, other than to wait for our own slope-planted plants to spread so I can photograph them at the optimum hours of the day. This entry was posted on Saturday, May 30th, 2009 at 1:16 pm and is filed under california natives, plants. You can follow any responses to this entry through the RSS 2.0 feed. You can leave a response, or trackback from your own site. Ah, the Fleming garden… Saw it 2 years ago, what a magical place! 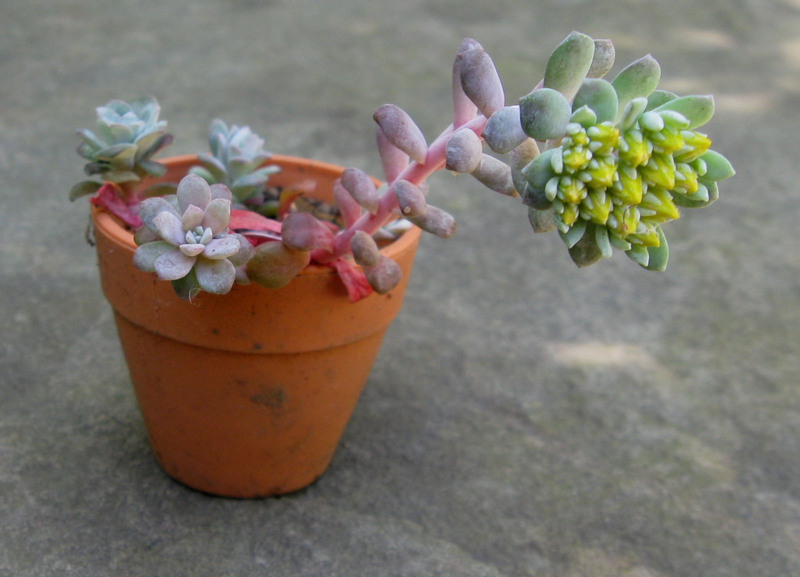 I have just recently started to grow Sedums, and like you, I prefer the buds on some of them. I have just recently started with sedums & other succulents also. They are so fun & add a nice change in texture to a dry landscape. I like the way it cascades down a slope. I agree about the color. So many of my silver-leaved plants have yellow flowers. It’s probably well-adapted to attract the bees, but the color combo isn’t what I’d have designed. 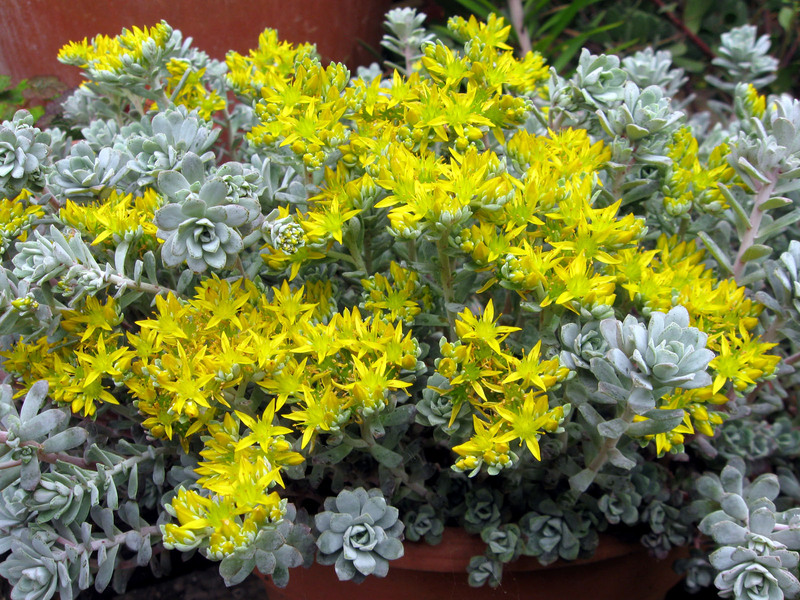 Sedum is such an adaptable plant, and I love using it where I can. But I must say that I think the bright yellow against the grey is spectacular! i need help. i have just fallen in love with sedums, however having problems with some of my plants especially Stonecrop Angelina. The plants are turning brown in the middle and slowly dying. We have had a lot of rain, however not sitting in water. I am in Knoxville, TN. Any help on soil or other suggestions is welcome. 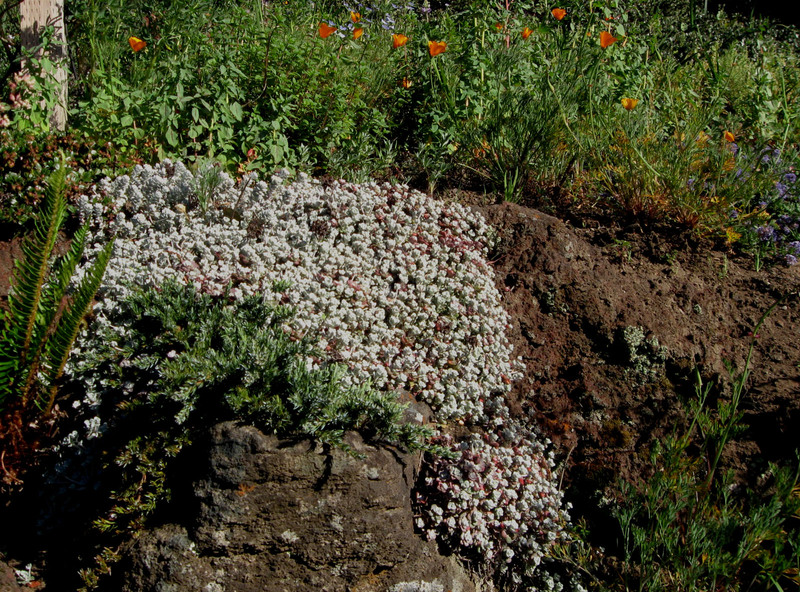 You might want to try to either plant the sedum on a mound to aid drainage. although I have not done this myself, I know some succulent experts who add a few inches of pumice or gravel to the bottom of the planting hole to guarantee good drainage. Also, when otherwise healthy plants die in the middle, it could be time to divide them.